Limited to 50 attendees, so get tickets soon! We are thrilled to invite you to a private tour of the exhibitions of Donna Gottschalk and Stephen Varble, led by Gonzalo Casals, the museum's Executive Director. The private tour will begin at 7:00 pm, followed by networking and a wine reception. Donna Gottschalk: Brave, Beautiful Outlaws features the work of Donna Gottschalk, a photographer active in the early period of radical lesbian organizing in New York and California during the 1970s. Gottschalk came out as a lesbian right at the formation of the radical lesbians and Furies collectives on the east coast, where she met lesbian artists JEB (Joan E. Biren), Flavia Rando, and others, and later moved to California to join lesbian-separatist communities. In both locations, Gottschalk photographed herself, friends, lovers, and activists in radical lesbian communities. 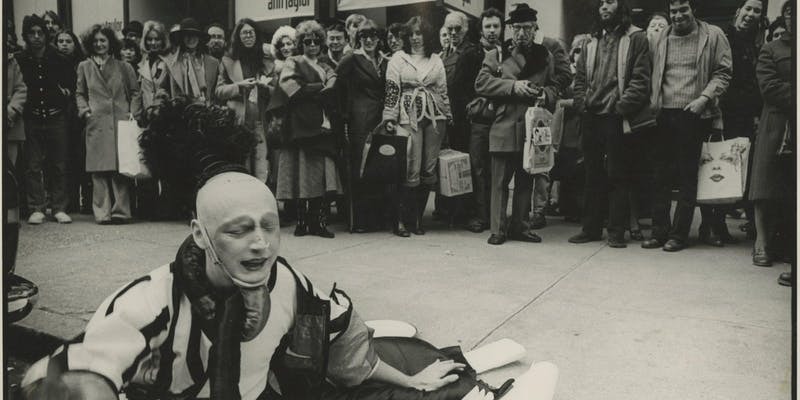 Rubbish and Dreams: the Genderqueer Performance Art of Stephen Varble, an exhibition focusing on this performance artist who became iconic in 1970s New York. Varble would engage in unauthorized and impromptu performance wearing elaborate costumes made from street trash, food waste, and stolen objects. His work was decidedly anti-institutional and he disrupted the business of art in the 1970s. For these reasons, he was soon written out of history, and no substantive piece of writing on his practice has been published for 40 years. This exhibition draws on a number of private archives in telling Varble's story for the first time. Special thanks to Eduardo Ayala Fuentes, Director of Development at the museum, for inviting the LGBTQ Alumni groups and to Shawn Cowls and FFR/Princeton BTGALA for organizing this special event! (Sorry but the prior link they gave me wasn't working).